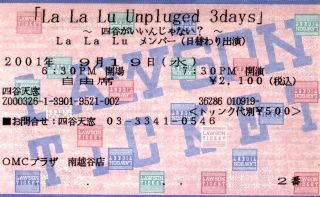 The third day of the LaLaLu Unplugged 3 Days event took place on September 19, 2001. All nine LaLaLu girls appeared, but Asuka, Ikue, and Noa came to the stage during the middle of the event. There was a lot of talk during this event, and the event flowed as follows.